The building of the convent and church in Kenmare provided several years of much needed employment for local tradesmen and laborers. However, after the Holy Cross Church was completed in 1864 the workmen and their families began to experience a most difficult time-poverty was extreme and there was no remunerative employment for women. It was then that the Poor Clare nuns under the leadership of Mother Abbess O’Hagan set upon a practical course to help the needy to help themselves, by establishing an industrial school in the convent building. There, young girls were chiefly employed in producing lace, but embroidery, woodcarving and leatherwork were developed also. Inevitably, much of the early work was spoiled and soiled but gradually, through patience and encouragement the products began to improve and many girls were capable of earning from five to eighteen shillings a week, a very considerable wage at that time.Sales figures reached £500 per annum by 1869 and it was about that time also, that the making of fine needlepoint lace began. Only Irish Crochet had been produced up to this but this had been developed so skilfully in design and execution that it became known as “Point d’Irelandaise” and it could be bought in Paris and London. At home, the wealthy tourists who traveled “The Prince of Wales Route” (Killarney to Glengarriff) on the long cars, were encouraged to call to the convent to view and purchase some lace, while four fresh horses were being harnessed for the continuation of their journey. At the Cork Exhibition of 1883 medals were awarded to Kenmare lace. This Exhibition created great interest in the art world of that era, where it was remarked that the designs generally were not worthy of such skilful and perfect execution. Later it became the turn of the girls to distinguish themselves and medals and prizes were constantly awarded to them in competitions with entries from all the art schools of Great Britain. The Department of Education now paid the school according to results and money received was used to improve facilities. Queen Victoria ordered a piece of lace in one of the prize designs and several connoisseurs-notably Mrs. Alfred Morrison of Forthill, Wiltshire and Mrs. Winacles, the wife of an American millionaire-placed many orders. A bedcover designed and worked specially for Mrs. Winacles, fetched £300 in 1886. Many pieces of fine embroidery were produced. A picture of the Crucifixion worked on fine linen is so perfectly stitched that one can scarcely believe it to be embroidery at all. Sr. Bonaventure Smith was the first artist to use Celtic tracery in 19th Century Ecclesiastical Vestments. She made Mitres for many members of the Irish, American and Australian Hierachy. Professor Lamour of Queens University came across her work in many places and gives her honourable mention in his recent book on “The Celtic Art Revival”. Two outstanding local lace-workers were Katie and Mary Jane Leahy who worked the well-known Tabernacle Veil, now in the National Museum. With a steady flow of fees from good results the nuns purchased the most sophisticated tools and equipment available at the time. With their savings, supplemented by a donation from an unknown benefactor, they erected a new wing which contained a spacious, well lighted room for the lace workers and a beautiful kindergarten. Teachers, who had obtained their art certificates in Kenmare, were readily employed in England and some of them were appointed “Specialist Teachers of Drawing” in London schools. With the changes brought about by the 1914-’18 war the market for lace declined and the workers emigrated, but the lace room with its display of antique and modern lace is still visited today by hundreds of tourists. 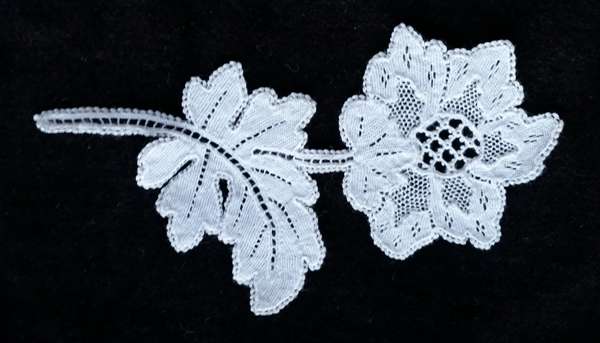 Continentals, Americans and Australians have seen samples of the lace in foreign museums and traced it to its source. Washington D.C., has in the National Museum a needlepoint hanging which depicts Eire with the Round Tower and Wolfhound. A major factor in the development of Kenmare Lace was the development of it’s own original designs. A school of design was established in Kenmare which was affiliated to the Kensington college of art in London and the Crawford school of Art in Cork, from this school came designs which won acclaim in exhibition around the world. Happily these designs have not been lost and today they form the basis of the revival of this cherished local skill. The building of the convent and church in Kenmare provided several years of much needed employment for local tradesmen and labourers. However, after the Holy Cross Church was completed in 1864 the workmen and their families began to experience a most difficult time-poverty was extreme and there was no remunerative employment for women. It was then that the Poor Clare nuns under the leadership of Mother Abbess O’Hagan set upon a practical course to help the needy to help themselves, by establishing an industrial school in the convent building. There, young girls were chiefly employed in producing lace, but embroidery, woodcarving and leatherwork were developed also. Inevitably, much of the early work was spoiled and soiled but gradually, through patience and encouragement the products began to improve and many girls were capable of earning from five to eighteen shillings a week, a very considerable wage at that time.Sales figures reached £500 per annum by 1869 and it was about that time also, that the making of fine needlepoint lace began. Only Irish Crochet had been produced up to this but this had been developed so skilfully in design and execution that it became known as “Point d’Irelandaise” and it could be bought in Paris and London. At home, the wealthy tourists who travelled “The Prince of Wales Route” (Killarney to Glengarriff) on the long cars, were encouraged to call to the convent to view and purchase some lace, while four fresh horses were being harnessed for the continuation of their journey. At the Cork Exhibition of 1883 medals were awarded to Kenmare lace. This Exhibition created great interest in the art world of that era, where it was remarked that the designs generally were not worthy of such skilful and perfect execution. King Edward VII purchased a collarette for Queen Alexandra and Queen Elizabeth II received among her wedding gifts an antique bed-cover of Kenmare Needlepoint. The Vatican has a needlepoint rochet designed in Kenmare and presented to Pope Leo XIII by the Irish Hierarchy and an embroidered mitre presented to Pope John Paul II in 1980 I name but a few of the well-known pieces extant.